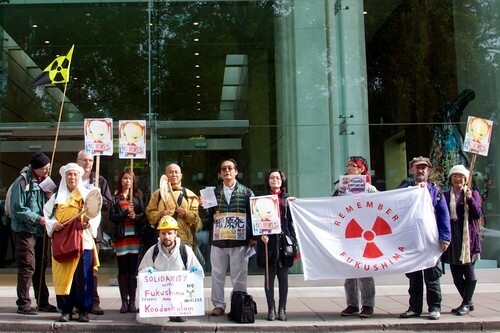 THIS FRIDAY WE WILL BE HOLDING A SOLIDARITY PROTEST OUTSIDE THE JAPANESE EMBASSY IN LONDON, FOLLOWED BY A SHORT PROTEST OUTSIDE THE OFFICES OF TEPCO, THE OPERATOR OF THE STRICKEN FUKUSHIMA-1 NUCLEAR POWER PLANT. Bring banners, placards, radiation suits, etc if you can, but at least bring yourself! On Friday 25 January, over two dozen people joined the demo as we read out and handed in a letter about the Fukushima disaster addressed to the Japanese Government. For this, we were joined by Kate Hudson, General Secretary of the Campaign for Nuclear Disarmament, a co-signatory to the letter (see text below). We have come here today as Japanese expatriates and UK citizens to support people in Japan and make four requests to the Japanese government. We would like the government to abolish nuclear power generation, to prevent the further release and spread of radioactive materials, to implement policies to protect people’s health and lives and to uphold citizens’ rights to engage in social activities and free speech. We are deeply concerned that radioactive contamination from the nuclear catastrophe at the Fukushima Daiichi Nuclear Power Plant that started on March 11 2011, has been spreading across Japan. The nuclear tragedies in Chernobyl and Fukushima have taught us that despite the guise of ‘peaceful use’, the destruction caused by a nuclear power disaster would be similar to nuclear war. Japan is the most earthquake prone country in the world and, currently, is in a very active seismic phase. Nuclear catastrophe in Japan would lead to long-term worldwide radioactive contamination. There is no safe method to dispose of nuclear waste. Using nuclear power means passing a burden to our children and their descendents. In addition, throughout the nuclear fuel cycle from uranium mining to decommission and waste storage, nuclear energy relies heavily on the sacrifice of workers who are exposed to radiation as they carry out these tasks. Given the deadly long-term toxicity of radiation released to the environment through use of nuclear energy, it must be said that nuclear power is both extremely dangerous and irresponsible. Following Fukushima, many people in Japan have been struggling to find any hope for the future. They are faced with the ongoing release of radiation, critical situations at Fukushima Daiichi and increased massive earthquake and tsunami risks. Many nuclear power and recycling plants are built on the seashore and often on active fault lines with an enormous amount of highly radioactive waste storage. Anticipated health damage from radiation exposure adds to the deep sense of insecurity and fear within the population. Residents in Fukushima and other contaminated regions have constantly been exposed to radiation since the onset of the nuclear disaster. There is independent evidence that a large proportion of Japan is contaminated. Radioactive materials have entered its ecosystem and food chain. Accumulated medical data indicates around 1 million people have died from various radiation-related illnesses in the years following the Chernobyl nuclear catastrophe. Many children have been suffering from atypical age-related illnesses including cataracts, heart and respiratory diseases due to long-term low dose radiation exposure. The prevalence of ill health has increased as time passes, a truly endless tragedy. The current scientific consensus is that there is no safe dose of radiation. The Japanese government’s campaign to spread the idea that ‘radiation below the safety limit is safe’ is misleading and incorrect. Children are Japan’s future. In the face of these grim realities, many citizens are still making courageous attempts to survive and where possible, safeguard future generations. In order to support people in Japan, we request the following actions by the Japanese government. (1) To withdraw from nuclear power generation immediately and switch to renewable energy as soon as possible. (2) To stop all nuclear power generation in Japan and commence decommissioning immediately. (3) To abandon all new nuclear builds and plans. (4) To end assistance and investment for all overseas projects to build and/or promote nuclear energy. (5) To stop all fuel recycling and fuel processing immediately. (6) Closely associated with above, Japan should continue to comply with the “three Non-Nuclear Principles” of not possessing, producing and permitting the introduction of nuclear weapons into Japan. (1) To prevent/minimise the further release and spread of radioactive materials. (2) To thoroughly investigate and publish the causes of the Fukushima nuclear catastrophe, disclose all information about ongoing crises at the plant, and take measures to minimise risk of deterioration. (3) To provide compensation to people for damages incurred by the disaster. (4) To draw widely on expertise regarding how and where to store spent nuclear fuel and highly radioactive waste and take measures to minimise the associated risks. (5) To seek international assistance as appropriate from organisations without vested nuclear interests. (6) To improve the working conditions and health management of workers engaged in decommissioning and other tasks involving radiation exposure. (1) To minimise radiation exposure of the general public by adopting a stringent policy based on the principles of prevention. (2) To reverse the policy to return all evacuees to their original locations. (3) To adopt the most strict internationally recognised evacuation standards and clarify the rights of those evacuees not wishing to return to the contaminated zone. (4) To promote community and school based collective evacuation in order to prevent destruction of social ties. (5) To ensure education, recuperation and other necessary measures to minimise radiation exposure in residents who do not evacuate. (6) To stop diluting and dispersing radioactive contamination immediately, and collect and store it securely away from the general public. (7) To reinstate the pre-Fukushima disaster nuclear safety standards. (8) To implement internationally recognised methods for radiation monitoring of soil, air, water, food, goods, wastes and wildlife. (9) To monitor radioactive nuclides additional to iodine and caesium. (10) To implement measures outlined in the Children and Nuclear Disaster Victims Law including frequent and appropriate health monitoring. (11) To tighten food safety standards taking into account the health damage caused by low level contamination observed in the Chernobyl disaster and implement stringent monitoring. (12) To monitor food contamination throughout the entire distribution and processing chains. (13) To make all monitoring data easily accessible to the general public. (14) To stop official campaigns promoting the idea that “radiation below the safety limit is safe”. (15) To provide school meals free from radioactive contamination. (16) To stop transporting, incinerating and burying of radioactive rubble and waste. (17) To manage and monitor processes involving incineration to ensure safety of workers and residents. (18) To make nuclear emergency plans that reflect the extent of the irreversible damage from the Fukushima Daiichi disaster and prevent similar tragedies from occurring in the future. (1) To uphold the rights and freedom of people who act to minimise the risk of nuclear disaster and radiation exposure. (2) To protect children and adults from radiation exposure, safeguard their rights to good health and life, and not to repress freedom of activity and speech of those who attempt to minimise radiation exposure in themselves and others. (3) To respect freedom of information and independent journalistic activities. (4) To make decisions according to the needs and wishes of those most affected by the decisions, namely the potential and actual victims of nuclear catastrophe and radiation exposure. Hiroshima, Nagasaki, Bikini and Fukushima. Japan has probably suffered more from nuclear damage than any other nation in the world. Why continue with this outdated and harmful technology? Japan should join countries like Germany leading the world towards a nuclear free future. People in Japan would then begin to find hope for the future. We thank Your Excellency for your kind attention to this statement. We trust that you will kindly pass our requests to His Excellency Mr. Shinzo Abe, Prime Minister of Japan and the Japanese government. We would like to maintain communications with your embassy for the benefit of Japan and therefore look foreward to your response.